This article will demonstrate a customized CListCtrl, which implements all the above features, while maintaining the Windows XP/Vista look. The CGridListCtrlEx tries to be simple, while still providing the ability to customize how a cell should be displayed and edited. In case Microsoft extends their CListCtrl again, then hopefully, the core of CGridListCtrlEx will continue to function. The CGridListCtrlEx tries to stay true to the CListCtrl, and doesn't try to replace anything the CListCtrl already provides. This means we can replace a CListCtrl with CGridListCtrlEx without needing to do anything more. It is recommended that we don't use the CGridListCtrlEx directly, but create a new class that inherits/derives from CGridListCtrlEx. This will make it easier to migrate any updates there will be to the CGridListCtrlEx class later on. By default, when inserting columns in the CGridListCtrlEx, they will be configured as read-only, without the ability to be edited. By using CGridListCtrlEx::InsertColumnTrait(), we can provide a CGridColumnTrait class which specifies what grid control type of editor it should use. When having edited an item, a standard LVN_ENDLABELEDIT message will be sent to the CListCtrl Library Source Code. When the CGridListCtrlEx receives this message, it will automatically call the virtual method CGridListCtrlEx::OnTraitEditComplete(), allowing a derived class to validate the input and maybe update an underlying data model. By using CGridListCtrlEx::InsertColumnTrait(), we can also provide a CGridColumnTrait class which works as a combobox. We can specify the items of the combobox when inserting the columns (as shown above). If we want to provide the combobox items dynamically, then we can override the CGridListCtrlEx::OnTraitEditBegin(), and then either use dynamic_cast<> or use the CGridColumnTraitVisitor to modify the items in the combobox. 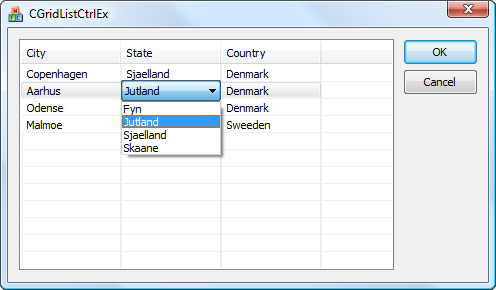 By default, the GridListCtrlEx will have sorting enabled for all columns, where it will perform a simple text-comparison. If we want a more advanced Grid Control sorting, then we can override the CGridListCtrlEx::SortColumn() method. Then, it is just a matter of choosing the right way to perform the sorting. See CListCtrl and Sorting Rows. By default, the CGridListCtrlEx will just display the cell contents as tooltip. If we want to display something different in the tooltip, then we can override the CGridListCtrlEx::GetCellTooltip() method. If we want to change the foreground/background color or the font style (bold, italic, underline), then we can override the methods CGridListCtrlEx::GetCellCustomColor() and CGridListCtrlEx::GetCellCustomFont(). CGridListCtrlEx tries to keep away from all the nasty details about how to display and edit data. These things are instead handled by the CGridColumnTrait class, and if we want to modify how data is displayed, then it is "just" a matter of creating a new Grid Contrl Library CGridColumnTrait class. When inserting a column, we can assign a Grid Contrl Library CGridColumnTrait to the column. The CGridListCtrlEx will activate the appropriate CGridColumnTrait when we need to draw a cell in that column, or edit a cell in the column. The CGridColumnTrait includes some Grid VC++ Source Code special members known as meta-data. These members can be used by your own class when it derives from CGridListCtrlEx, so we can easily add extra properties to a column. If performing custom drawing, we must also handle the selection and focus coloring. If performing editing, we must ensure that the editor closes when it loses focus, and also sends a LVN_ENDLABELEDIT message when the edit is complete. Only the group-style handling should be part of the CGridListCtrlEx itself, while the other features should be handled with new specialized CGridColumnTraits.